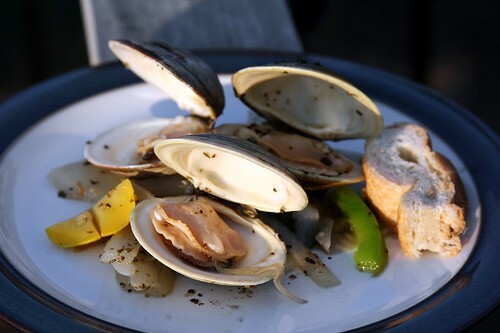 clams mcgeechee: from farm to table, originally uploaded by aarn! +13th April, 2010+. lightly browned a diced onion in a large stock pot containing 1/2c. olive oil. added a pinch of salt and pepper, one sliced green bell pepper, one diced yellow crookneck squash, and 1c. white wine. allowed the mixture to come to a healthy simmer, then added 3T. minced garlic, 2T. fresh chopped oregano, 2T. fresh chopped basil, zest and juice from 1/2 lemon, and a pinch of crushed red pepper flakes. added 3-4 dozen top neck size clams (approximately 1.5 inches in thickness), and steamed/boiled on high heat until all of the clam shells had opened. poured into a large dish and served family style with a loaf of french bread for sopping, and a palmetto pale ale to wash it down. just found this too.. awesome. jeal;ouse you got into ATK as well. and @vincent will check out that petitchef, good call.